Muscat Grand Mall (MGM), a leading shopping and entertainment destination in Oman, has announced its participation in the Muscat Festival 2019 with the launch of a ‘Shop and Win’ campaign. The annual festival, which kicked off on January 10, is taking place at Al Amirat Park, Al Naseem Park and Oman Automobile Association, including other halls and cultural clubs. ‘Shop and Win’ will commemorate the commencement of Muscat Festival 2019 and includes discounts up to 80 per cent off at various retailers within the mall. For every RO20 ($51.8) spent, shoppers will earn one coupon, while four coupons can be obtained for purchases made with the Mazaya Grand Card. 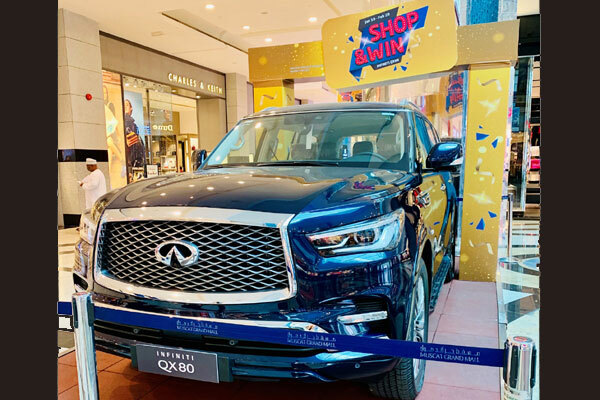 This will provide them with a greater opportunity of winning the Infiniti QX80 during the promotional period with valid purchases made through the card. Launched last year, the Mazaya Grand Advantage Card is a one-of-a-kind purchasing service that enables consumers to benefit from offers across several facilities and projects. With a minimum top-up of RO5 ($12.9), the Mazaya Grand Advantage Card uses state-of-the-art technology to facilitate purchases and redeem various discounts and offers at MGM, and other real estate partners. The card can be used to buy property, book rooms, and shop or request services from participating retailers. The card will be valid for 12 months from the date of purchase. “Additionally, we will also be hosting several events and activities at the mall during the festival days. We look forward to the success of our ‘Shop and Win’ campaign due to the attractive offers it provides customers. Since the promotion coincides with Muscat Festival 2019, the flow of visitors will also boost footfall and increase business within the mall,” Jaboub added.